As we wait for the buds on the trees to open up, bulbs to boom and beds to thaw for planting, there is one thing you don't need to wait on. Fixing your lawn. If the snow is gone, you can start "greening up" your lawn. It can take some time to repair the damage and get your lawn looking green, healthy and fresh as quickly as possible. Here are our favorite products for early spring lawn care. An application of Top Dressing will result in three benefits for your lawn. 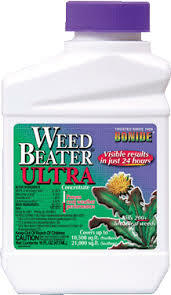 If you are spraying for weeds this spring, you NEED to use Weed Beater Ultra. This product prevents germination. Depending on the weather, you may want to wait until mid-to-late April to apply. Also, this will prevent germination of new seed for up to 6 weeks. Most herbicides like Ortho Weed-b-Gon are not effective in cool temperatures. Weed Beater Ultra is effective EVEN in cool temperatures. It is also the MOST effective selective herbicide on hard-to-kill creeping Charlie. It contains four different active ingredients for a SURE KILL. It kills weeds but NOT the lawn. Do you have salt or dog urine damage? Sprinkle spots with Fast Acting Gypsum. Water thoroughly after the application. If the spots are larger than about 8" in diameter, we recommend some re-seeding. (see our tips and recommendations below). Were Grubs a Problem Last Year? Kill grubs now with an application of Bayer 24 Hour Grub Control. We sense this is going to be a popular fix this spring! Wait for a good rain, and then apply Ultra Revive Lawn Spray. Water thoroughly after application. You get what you pay for when you buy grass seed! "Cheap" grass seed companies often add annual grasses to their mix because it is inexpensive and it germinates quickly. The trouble is... its ANNUAL. It will die over the winter. If you're like me, you want your lawn to survive year after year, so start with QUALITY seed. We carry Emerald Park Premium Grass Seed (for sun or shade) that is a mix of 100% perennial grasses and is enhanced with QUICKSTART micro nutrients. You'll see the difference! It contains a starter fertilizer that gets the seed off to a great start. It contains AST Advanced Soil Technology that helps reduce soil crusting. It contains polymers that become tacky when watered and help STICK the seed to the soil preventing erosion. I believe this 4-step Lawn Care program is the best on the market. Watch the video and learn how an organic system can help you encourage a happy, green, healthy lawn. The Barn's Annual Mulch Madness Sale has begun! Order bulk mulch now through April 14th and get $5 off per yard. We also offer fast, convenient delivery and will deliver ALL your lawn care supplies for one flat fee. Add on Milorganite, Gypsum, Grass Seed, Fertilizer, Nutri-pel, bagged soil amendments and more. No more heavy lifting or extra errands. Questions? Give us a call at 847-658-3883 or just stop in our Garden Center. All of these products are available NOW, so take advantage of a sunny day and get outside.